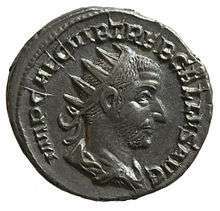 Trebonianus Gallus (Latin: Gaius Vibius Afinius Trebonianus Gallus Augustus; 206 – August 253), also known as Gallus, was Roman Emperor from 251 to 253, in a joint rule with his son Volusianus. ↑ In Classical Latin, Gallus' name would be inscribed as CAIVS VIBIVS AFINIVS TREBONIANVS GALLVS AVGVSTVS. ↑ Potter (2004), pp. 247–248. ↑ Cambridge Ancient History, pp. 39–40. ↑ Potter (2004), p. 248. 1 2 Cambridge Ancient History, p. 40. ↑ Cambridge Ancient History, p. 636. ↑ Potter (2004), pp. 248–249. ↑ Potter (2004), pp. 249–250. 1 2 Potter (2004), p. 252. ↑ See Bray (1997), p. 38, for both versions of the story and their sources. ↑ The Cambridge Ancient History, p. 41. ↑ Bray (1997), p. 38.